Whitestem Evening Primrose, Oenothera albicaulis, growing on a hillside near Pawnee Buttes Pawnee National Grassland, Colorado. Elevation is 5,420 Feet, May 22, 2007. 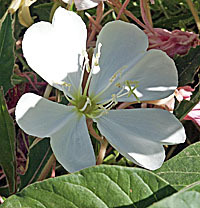 Distinctive with large white flowers, flower width 60 mm, plant height 20 cm. Leaves are basal and stem, basal length 85 mm, width 18 mm, stem length 50 mm, width 15 mm. Photos above are the same species from Ghost Ranch, New Mexico. Likes sandy grasslands. 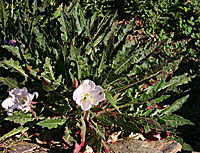 Tufted Evening Primrose, Oenothera caespitosa, growing at the Sonoran Desert Museum just west of Tucson, Arizona, 2,680 Feet, March 8, 2007. Photos taken in the morning. Plant height is 7 in. , flower width 81mm, petal length 46 mm, leaves basal length 100 mm, width 28mm, petiole about 40 mm. Combleaf Evening Primrose, Oenothera coronopifolia, growing on hillside near Pawnee Buttes Trailhead, 5,420 Feet, May 21, 2007. Plant height is 15 cm., flower width 28 mm, leaves finely divided, length 55 mm, width 15 mm. Oenothera deltoides, Dune Evening Primrose, growing on sandy dunes by the Colorado River, Grand Canyon, Arizona, 2,550 feet, March 31, 2003. 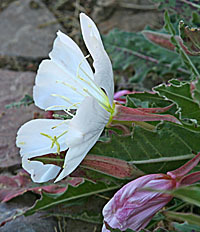 Oenothera elata, Hookers Evening Primrose, growing in a meadow in Phantom Canyon, Pikes Peak Massif, 8,600 foot elevation, July 9, 2006. Substrate is granite outhwash from Pikes Peak Granite. Pale Evening Primrose, Oenothera pallida,growing in warm microclimate on south facing dune in Mee Canyon near the big alcove, just west of Colorado National monument, 5,400 feet, Sept. 21, 2006, plant height 30 cm., leaves basal and stem. Stem leaves are alternate length 53 mm, width 3-4 mm, flower width 24 mm, petal length 16 mm. Oenothera primiveris, Desert Evening Primrose, growing on the desert pavement on mesas East of Sheep Bridge,Arizona, 2,150 feet, March 15, 2005.